Track and trace Learners results. What do SCORM compliance, AICC, XAPI and CMI5 mean? Updated! Do you want to buy a LMS or an authoring tool and are you wondering what the best option is for tracking the results of your learners? Are you confused by all the abbreviations like: SCORM, AICC, XAPI, and CMI5? Here is an overview that will help you out. Do you want to buy an LMS or an authoring tool and are you wondering what the best option is for tracking the results of your learners? Or are you just confused by all the abbreviations like SCORM, AICC, XAPI, and CMI5? Here is an overview that will help you out. I originally wrote this post in early 2015. I have just gone through it and updated it with the latest developments and made some other adjustments. 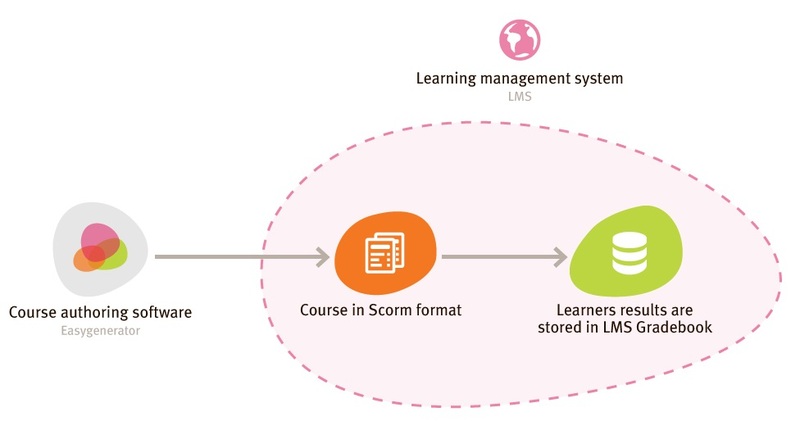 SCORM is a standard in e-Learning that makes it possible to track and trace the results of your learners in a Learning Management system (LMS). A course is SCORM compliant when it meets the requirements of the standard set by the ADL. It makes it possible to create an e-Learning course in any authoring environment and run it in any SCORM compliant LMS and report your learners results to that LMS. Which results will be stored? You name it, it can be registered and stored. No, it doesn’t. SCORM has a compulsory part (the result part) but also elements that can be added optionally. Bookmarking (the storage of incomplete results) and results per learning objective are optional. This means that if you want to buy an authoring tool or an LMS you should check if they support the elements that you need! And there is a second but: reporting. If the results are stored in the database of your LMS it does not mean you can get them out in an easy way. That depends on the reports the LMS is offering. Some LMS have very complete reports or allow you to create your own. If you want to make sure that the LMS does what you need, just check the reporting function! Yes, there are two versions of SCORM: SCORM 1.2 and SCORM 2004. The latest version is SCORM 2004 but both are still in use. The oldest version (SCORM 1.2) is the most popular one. So what is the difference? In fact, if you just want to have a report on your learners results both will do. They have the same reporting elements for that. The main difference between the two is that SCORM 2004 adds options for complex navigation and sequencing. If you need that, make sure both your authoring environment and your LMS are both SCORM 2004 compliant. If you just need the learner’s results SCORM 1.2 will do as well. The latest version of SCORM dates back to 2004 (although there were updates). That is a decade ago, it is ancient. In the meantime, we have seen the rise of mobile learning (with smartphones and tablets) and the world of learning has changed fundamentally. Is there nothing more up to date? Yes, of course, there is. We now have XAPI, formerly known as (project) TinCan. It can do what SCORM can but there are major differences. So what is new, what is the difference? The big limitation of SCORM is that it can only track and trace your learner’s results if your learners are learning within your LMS. One of the big trends in e-Learning is that e-Learning is becoming more informal and is moving to the workplace and to mobile devices. In short, people are learning more outside an LMS than in an LMS. XAPI allows tracking and tracing from anywhere. So you should choose an authoring tool or an LMS that supports XAPI. This makes it possible to publish your course or quiz on a website, a blog, in an app on a smartphone. XAPI will still track and trace the results. But there is more. XAPI is short for ‘eXperience API’. An API is a technique that allows software to exchange information. XAPI is not created to capture formal learning results, it is meant to exchange and capture learning experiences. That makes a big difference. When you are performing a task for the first time, you will learn. That is something that happens in the real world and not within the boundaries of an LMS. SCORM cannot help you here, but XAPI can. It allows the learner to record this learning experience and the result. It is stored in a database that is called a Learning Record Store (LRS). XAPI reports through statements that have a specific structure: I (actor) did (verb) this (activity). So a statement could be: Kasper Spiro wrote a post on XAPI. In fact, I did and you can read it here. What does this mean to you? Not that much yet I’m afraid. Almost everybody loves the idea of tracking learning experiences from everywhere. But how do you use it in a way that is simple and that it adds value to your learning? That is more difficult. It is for Vendors like Easygenerator or other authoring tools to come up with simple and useful applications of the XAPI. An example is that Easygenerator will add the ability to add assignments to your courses. These assignments need to be performed in the real world. In the assignment, the learner will have an option to report on the result of this learning experience by simply filling in a simple field. We will use XAPI to store and report that. It will be in our product somewhere in 2015. In short, if you want to be future proof, make sure your authoring tool and LMS both support XAPI. As said SCORM is ancient. There is a new standard in development that will be the next generation of SCORM. It is called CMI5. It uses the technique of XAPI, but it will add default statements to track and trace the learner’s results in a formal e-Learning course. They are recreating SCORM based on XAPI. It will be more flexible in the sense that you can track and trace learning results outside an LMS, but it will be only used for formal learning activities like a course, a quiz or an exam. *Update June 2017. CMI5 is now available as a standard. Now it has to be adopted and built in by the LMS, which is a slow process. And yes there is yet another standard in the e-learning world. It comes from the aviation industry and it is called AICC. This standard is even older than SCORM, it dates back to 1993. But it is mainly used in the Aviation industry and some technical industries. You can consider it as a competitor of SCORM. The good news is that both Scorm and AICC will merge into CMI5, the new XAPI based standard. That really depends on your requirements. The big advantage of SCORM is that you can use an external authoring tool, so you don’t have to create your courses in an LMS. The big advantage of that is that your courses will not depend on your LMS; You can use them in any LMS. When you want to switch from LMS or publish your courses on the web, that is possible from most authoring tools. Courses created in an LMS are locked into that LMS. If you leave that LMS you will leave all your courses behind, creating a real undesirable ‘vendor lock-in’. If it is just for the tracking and tracing of results you do not need SCORM. Easygenerator, for example, is an e-Learning authoring tool, but it offers also the possibility to publish the courses to one of its servers and to track and trace the results from your learners.